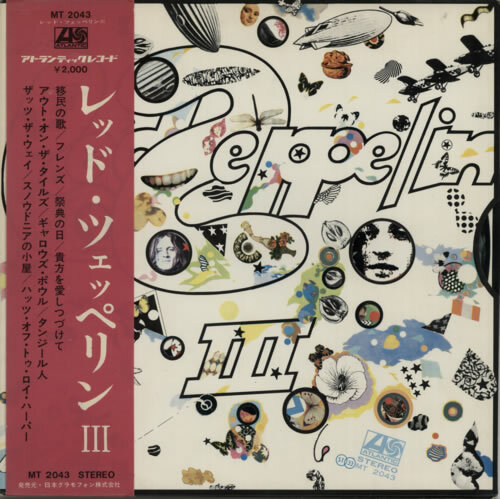 LED ZEPPELIN Led Zeppelin III (Original 1970 Japanese 10-track stereo LP on the blue & green Atlantic label manufactured by Nippon Grammophon, housed in a revolving die-cut matt picture sleeve with lyric insert & obi-strip. This is a near mintcopy. The sleeve displays light wear and signs of age with no splits, rips or signs of foxing and the vinyl appears near 'as new' with only one or two spindle marks on the labels to show that it has been played only a couple of times, an outstanding example MT2043).